. : Farm Forest Line - Harvesting options and techniques :. If timber is the only desired product from a farm forest, and the aim is to maximise profit, clearfelling large areas will reduce harvesting costs and probably maximise the return. However, where trees also provide salinity control, wildlife, shelter or other values, harvesting small volumes over a longer period might be preferred. The cost effectiveness of different harvesting methods may also depend on the size of logs and how accessible they are. For example, large, pruned and well-spaced trees are easier to harvest than small, branchy trees growing in a dense plantation. This allows a trained operator using a chainsaw, farm tractor, loader and log trailer to be cost competitive with an operator using specialised mechanical log harvesting machines. 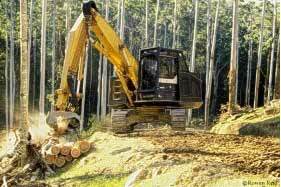 In some circumstances, the costs associated with using small scale logging equipment can be higher than the trees value. The harvesting method chosen will also depend on regeneration requirements. Light demanding species, such as eucalypts, might need to be a full tree height away from any mature trees to grow well. This means that a gap of 3050 metres might be needed. More shade-tolerant speciesfor example, rainforest trees or softwoodsmight grow well in the gap left after one tree is harvested. In some cases the second generation can be grown amongst well-spaced older trees prior to harvest.